Who’s ya boy in Slovenia??? Breakdown of Obtuse View readers by country! THANK YOU TO ALL THE READERS OF OBTUSE VIEW!!! For pet food manufacturers there is new profit margin to be derived from falling raw materials costs. After a long period of rapid growth, pet products’ raw materials costs fell in 2009, mainly as the real economy began to deteriorate following the late 2008 downturn. At the retail-end, demand for pet food products, especially dog and cat food, has not halted. This actually provided better margins for pet food manufacturers, with lower costs on the production side, concomitant with an upward retail unit price trend. With the pet industry soaring (SOARING HOW HIGH YOU ASK? )the pet food industry in China is skyrocketing (ZOOM) ! THAT IS SO GREAT … OR IS IT? This is not all squeaky chew toys and Alpo for China’s government. 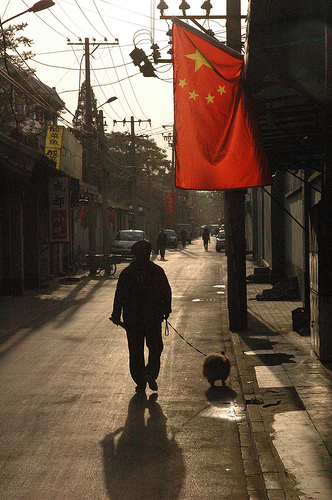 Chinese people owning pets shows disposable income (YEAH!) and a the people are focued on things other than strange disappearances, unwarranted imprisonment, executing mentally ill people, and religious discrimination and persecution that the hard line communist regime in power needs to promote to survive. Owning a Cockatoo is hardly a common sign of socialist/communist tyranny. Is Hu Jintao and Wen Jaibao‘s Chinese Government a “kinder,gentler” socialist/communist government? With a human rights violation list a mile long (THE CURRENT LIST) thank god the pets are being cared for and their rights being looked after. When will the Chinese government do for their citizens what the citizens are doing for their newly acquired pets?